figure3 has developed the new offices of apparel and home goods company TJX located in Mississauga, Canada. Branded ‘Envision’ and laid out like the map of Canada, this 400,000 sf fashion mecca is TJX’s ode to Canada. From the studs to the soaring 3-story staircase, each design element was chosen to reinforce the TJX mission of delivering great value to customers through the combination of brand, fashion, price, and quality. The 3-story staircase and airy central atrium strategically control people-flow throughout the facility, while a fashion runway ‘in the sky’ connects the two towers of the design-build complex and reinforces the organization’s fashion focus. To manage the influx of inventory, incoming and outgoing merchandise was centralized – significantly reducing storage needs on each merchandising floor and freeing up floor space for collaboration zones and amenities. 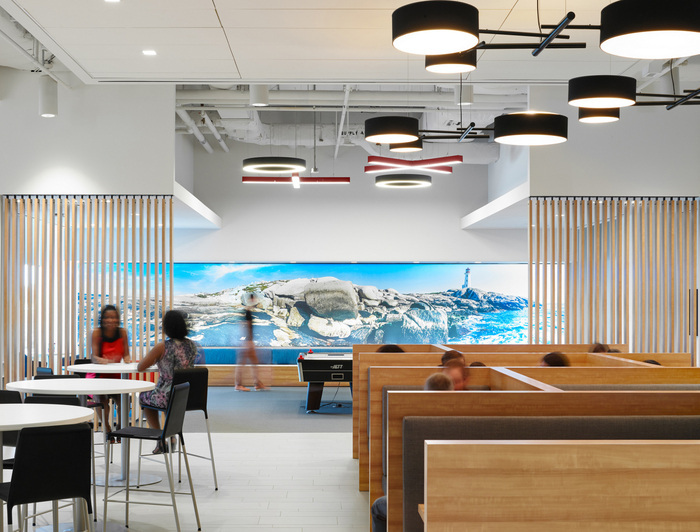 From the gym/yoga studio to the fully loaded auditorium-style theatre and airy Marche-style cafeteria with wraparound patio – TJX’s emphasis on work life balance is reinforced in the workplace. Just shy of 10,000 square feet, the lunchroom and games area is fitted out with banquettes, benches and family-style salvaged wood harvest tables (not to mention ping pong and air hockey), easily accommodating diners, ad-hoc meetings and employees looking to blow off steam with their colleagues. 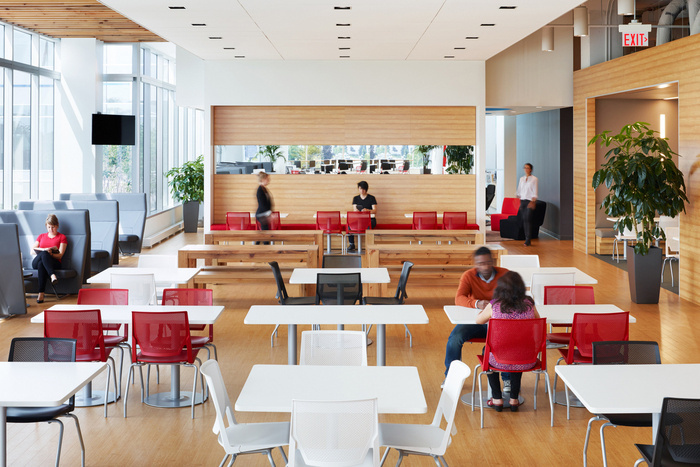 Finally, true flexibility comes from the ability to seamlessly accommodate change. Built into the base building design is the ability for each floorplate in the west tower to expand 10,000 square feet – providing future-proofing for TJX. Bright, expressive, efficient and just that much more fabulous than you would expect, the new TJX Canada is a clear statement of focus.